The program replaces the Start menu. The menu is only replaced when the program is loaded. Start Menu 10 adds itself to the autostart list during installation, but you can change this using the msconfig utility. You can access the program settings by right-clicking the program icon in the notification area (near the clock) or right-clicking anywhere in the menu. 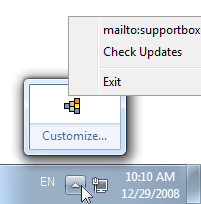 To exit the program, select "Exit" in the context menu. To uninstall the program, find the Start Menu 10 folder in menu and run Uninstall shortcut or use the system application management tool - "Control Panel -> Programs"
The portable version of the program stores all of its settings in files located in the program folder.